Sit back, relax and take in the view inside one of Denver’s most iconic historic landmarks, Denver Union Station. Located in the heart of Downtown Denver, the newly renovated 1914 Beaux-Arts train station is home to 10 chef-owned restaurants and bars, boutique shops and the 112-room Crawford Hotel. 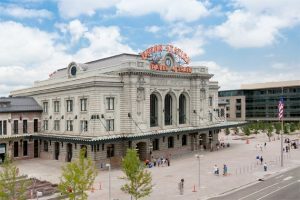 Denver Union Station is also the transportation hub for The Mile High City, offering access to RTD’s front-range bus route, the free 16th Street Mall shuttle, the free Downtown Denver Circulator, the FasTracks light rail line and Amtrak trains. The Moonlight Dome and Amtrak’s train #5 California Zephyr take you and your guests through Illinois, Iowa and Nebraska before arriving in Denver, Colorado at 7:15 am the next morning. Tour the many attractions Denver has to offer over the next two days. Whether you decide to explore downtown Denver, Cherry Creek, or City Park, whatever you choose to do, you set the schedule and the pace. Reserve a rental car and drive to Echo Lake or Boulder, Colorado which are just a short drive away. Departure from Denver is scheduled for 7:10 p.m. on train #6 California Zephyr. Enjoy a late dinner and relax in the observation dome as we gently roll eastward back to Chicago. After a peaceful night’s sleep, enjoy a continental breakfast and lunch before our 2:50 p.m. arrival back unto Chicago’s Union Station. Your fare includes: lease of our private rail for stated itinerary, all rail switching and carrier fees, all food and beverages as noted, your full time chef/attendant, on board sleeping accommodations, rail car parking fees and all of the “extras” that will make your trip one that you and your guests will never forget! All meals and beverages included while the train is enroute. Off car excursions, meals, and gratuity for your onboard staff are not included in pricing. Contact ZEPHYR ROUTE 630-542-3607, OR ZEPHYR360@ATT.NET to book your passage. This is a trip not to miss….Only a few bedrooms left!